I'm using Xcode 6 Beta 6. This is something that's been bugging me for some time now, but it's reaching a point where it's barely usable now. My project is starting to have a decent size of 65 Swift files and a few bridged Objective-C files (which are really not the cause of the problem). It seems like any slight modification to any Swift file (like adding a simple white space in a class that's barely used in the app) will cause the entire Swift files for the specified target to be recompiled. After a deeper investigation, I've found that what is taking pretty much 100% of the compiler time is the CompileSwift phase where Xcode runs the swiftc command on all Swift files of your target. I did some further investigation, and if I only keep the app delegate with a default controller the compilation is very fast, but as I was adding more and more of my project files, the compile time was starting to get really slow. Now with only 65 source files, it takes about 8/10 seconds to compile each time. Not very swift at all. I haven't seen any post talking about this issue except this one, but it was an old version of Xcode 6. So I'm wondering if I'm the only one in that case. I've checked a few Swift projects on GitHub like Alamofire, Euler and CryptoSwift, but none of them had enough Swift files to actually compare. The only project I found that was starting a have decent size was SwiftHN, and even though it only had a dozen source files I was still able to verify the same thing, one simple space and the whole project needed recompilation which was starting to take a little time (2/3 seconds). Compared to Objective-C code where both analyzer and compilation are blazing fast, this really feels like Swift will never be able to handle big projects, but please tell me I'm wrong. Still no improvement whatsoever. This is starting to get ridiculous. With the lack of #import in Swift, I really don't see how Apple will ever be able to optimize this. Don't rejoice too quickly as I did. The graph solver that they use to make the build incremental is not very well optimised yet. Indeed first, it doesn't look at function signature changes so if you add a space in the block of one method, all files depending on that class will be recompiled. Now if you modify FileA, the compiler will obviously mark FileA to be recompiled. It will also recompile FileB (that would be OK based on the changes to FileA), but also FileC because FileB is recompiled, and that is pretty bad because FileC never uses FileA here. So I hope they improve that dependency tree solver... I've opened a radar with this sample code. I have given it a try and I must say it is working really (really !) well now. They greatly optimized the incremental builds in swift. It's been a while since my last update on this issue so here it is. Our app is now about 20k lines of almost exclusively Swift code, which is decent but not outstanding. It underwent swift 2 and than swift 3 migration. It takes about 5/6m to compile on a mid 2014 Macbook pro (2.5 GHz Intel Core i7) which is okay on a clean build. Create a new project and move your files hierarchy to the new one. I will try solution 3 but solution 1/2 didn't work for us. What's ironically funny in this whole situation is that looking at the first post on this issue we were using Xcode 6 with I believe swift 1 or swift 1.1 code when we reached the first compilations slugginess and now about two years later despite actual improvements from Apple the situation is just as bad as it was with Xcode 6. How ironic. Anyways I see this SO post has 32k+ views and 143 ups as of this writing so I guess I'm not the only one. Hang in there guys despite being pessimistic over this situation there might be some light at the end of the tunnel. If you have the time (and courage!) I guess Apple welcomes radar about this. Stumble upon this today. 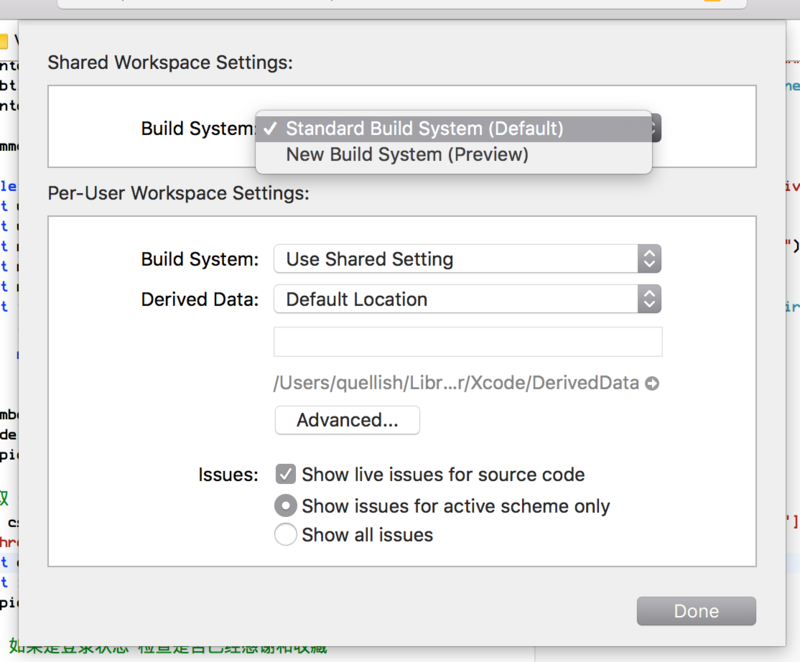 Xcode quietly introduced a new build system to improve on the current awful performance. You have to enable it through the workspace settings. Have given a try yet but will update this post after it's done. Looks promising though. Well, it turned out that Rob Napier was right. It was one single file (actually one method) that was causing the compiler to go berzek. "title" : self.title ?? "" because the property title was of type var title:String? and not NSString. The compiler was going crazy when adding it to the NSMutableDictionary. made the compilation go from 10/15 seconds (maybe even more) down to a single second... amazing. We've tried quite a few things to combat this as we have around 100k lines of Swift code and 300k lines of ObjC code. Next we wrote a script to merge all the swift files into one file, this breaks access levels but it brought our compile time from 5-6min to ~1minute. When these flags are set, the compiler will compile all Swift files in one step. We found with our merge script this is much faster than compiling files individually. However, without the '-Onone' override, it will also optimize the whole module, which is slower. When we set the '-Onone' flag in the other Swift flags, it stops the optimization, but it doesn't stop compiling all Swift files in one step. We've found these settings allow our Swift code to compile in 30 seconds :-) I've no evidence of how it would work on other projects, but I suggest giving it a try if Swift compile times are still an issue for you. Note for your App store builds, you should leave the '-Onone' flag out, as the optimization is recommended for production builds. If you're trying to identify specific files that slow down your compile time, you could try compiling it from your command line via xctool which will give you compile times file by file. The thing to note is that, by default, it builds 2 files concurrently per each CPU core, and will not give you the "net" elapsed time, but the absolute "user" time. This way all the timings even out between parallelized files and look very similar. To overcome this, set the -jobs flag to 1, so that it doesn't parallelize file builds. It will take longer, but in the end you'll have "net" compile times that you can compare file by file. From this output you can quickly identify which files are taking longer than others to compile. Moreover, you can determine with high accuracy whether your refactorings (explicit casts, type hints, etc...) are lowering compile times for specific files or not. NOTE: technically you could also do it with xcodebuild but the output is incredibly verbose and hard to consume. It likely has little to do with the size of your project. It's probably some specific piece of code, possibly even just one line. You can test this out by trying to compile one file at a time rather than the whole project. Or try watching the build logs to see which file is taking so long. Simplify that by just a line or two and it compiles almost instantly. The trouble is something about this is causing exponential growth (possibly factorial growth) in the compiler. Obviously that's not ideal, and if you can isolate such situations, you should open radars to help get those issues cleaned up. In my case, Xcode 7 did no difference at all. I had multiple functions requiring several seconds to compile. After unwrapping the optionals, the build time dropped by 99.4%. See more examples in this post and this post. I developed an Xcode plug-in which may come in handy for anyone experiencing these issues. There appears to be improvements coming in Swift 3 so hopefully we'll see our Swift code compile quicker then. This worked for almost every other problem I ran into regarding data types I hard coded into my application. One thing to note is that the Swift type inference engine can be very slow with nested types. You can get a general idea about what is causing the slowness by watching the build log for individual compilation units that are taking a long time and then copying & pasting the full Xcode-spawned command into a Terminal window and then hitting CTRL-\ to get some diagnostics. Take a look at http://blog.impathic.com/post/99647568844/debugging-slow-swift-compile-times for a full example. Probably we cannot fix the Swift compiler, but something we can fix is our code! There is a hidden option in Swift compiler that prints out the exact time intervals that compiler takes to compile every single function: -Xfrontend -debug-time-function-bodies. It allows us to find bottlenecks in our code and significantly improve compile time. Awesome Brian Irace wrote brilliant article about it Profiling your Swift compilation times. Since all this stuff is in Beta, and since the Swift compiler is (at least as of today) not open, I guess there is no real answer to your question. First of all, comparing Objective-C to Swift compiler is somehow cruel. Swift is still in Beta, and I am sure Apple is working in providing functionality and fixing bugs, more than providing lightning speed (you don't start building a house by buying the furniture). I guess Apple will optimize the compiler in due time. If for some reason all source files have to be compiled completey, an option might be to create separated modules/libraries. But this option is not yet possible, as Swift cannot allow libraries until the language is stable. My guess is that they will optimize the compiler. For the same reason that we cannot create pre-compiled modules, it could well be that the compiler needs to compile everything from scratch. But once the language reaches a stable version and the binaries' format is not changing anymore, we will be able to create our libraries, and maybe (?) the compiler will also be able to optimize its work. Adding this flag dropped our clean-build compile times from 7 mins to 65s for a 40KLOC swift project, miraculously. Also can confirm 2 friends have seen similar improvements on enterprise projects. EDIT: It doesn't seem to work anymore in Xcode 8.3 for some people. Use Swift for parts of your project that are quite stable and don't change often. For other areas where you need to change very often or areas that require lot of compile/run iterations to be complete (almost any UI related stuff), better use Objective-C with a mix-and-match approach. Relief the swift type inference engine by giving some hints with explicit casts. In project build settings, search for "Optimization" Turn Debug to "Fastest[-O3]" or above. But, make sure you at least set "DWARF with dSYM" (if you want to monitor your application) and Build Active Architecture to "NO" for Release/Archiving to push to iTunes Connect (I remember wasting a few hours here too). The compiler spends a lot of time inferring and checking the types. So adding type annotations helps the compiler a lot. Then the compiler takes a while to figure out what the type of sum should be. Adding the type helps. What also helps is pulling the intermittent steps into separate variables. Especially for numeric types CGFloat, Int it can help a lot. A literal number like 2 can represent many different numeric types. So the compiler needs to figure out from the context which one it is. Functions that take a lot of time to look up like + should also be avoided. Using several + to concatenate several arrays is slow because the compiler needs to figure out which implementation of + should be called for each +. So use a var a: [Foo] with append() instead if possible. You can add a warning to detect which functions are slow to compile in Xcode. to warn for every function that takes longer than 100 ms to compile. Rebooting my Mac did wonders for this issue. I went from 15 minute builds to 30 second builds just by rebooting. NOTE: This works for Swift 3.1 and above only. Source files that haven’t changed will no longer be re-compiled by default, which will significantly improve build times for most common cases. Larger structural changes to your code may still require multiple files to be rebuilt. Debug builds produce binaries that run considerably faster, and new optimizations deliver even better Release build performance. Clearer error and warning messages, along with new Fix-its, make it easier to write proper Swift 1.2 code. The most common compiler crashes have been fixed. You should also see fewer SourceKit warnings within the Xcode editor. Here's another case that can cause massive slowdowns with type inference. Coalescing operators. Nothing worked for me in Xcode 6.3.1 - when I added arround 100 Swift files Xcode randomly hanged on build and/or indexing. I've tried a modular option with no success. Installing and using Xcode 6.4 Beta actually worked for me. This has been working like magic for me - Speed Up Swift Compilation. It reduced compilation time to 3 minutes from 10 minutes. It says you should turn on the Whole Module Optimization while adding -Onone in Other Swift Flags. I'm using Swift 3 on Xcode 8.3/Xcode 8.2. Not the answer you're looking for? Browse other questions tagged compilation swift or ask your own question. How to handle large Swift Project? How to track down slow compiling Swift code? Swift project is taking a long time to build. What can I do? 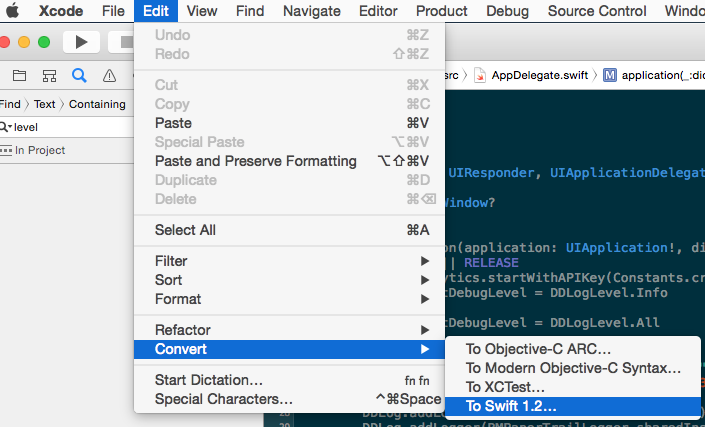 Xcode can only refactor C and Objective-C code. How to rename swift class name in Xcode 6?